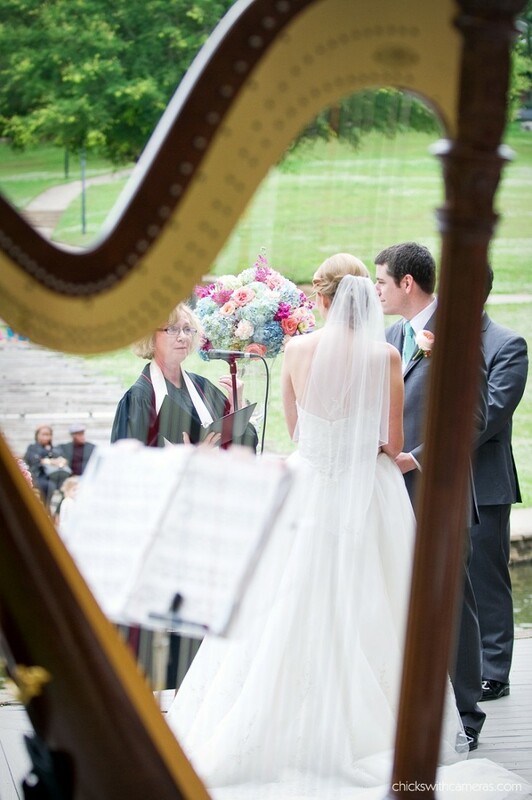 Harp adds elegance and charm to any wedding or event! 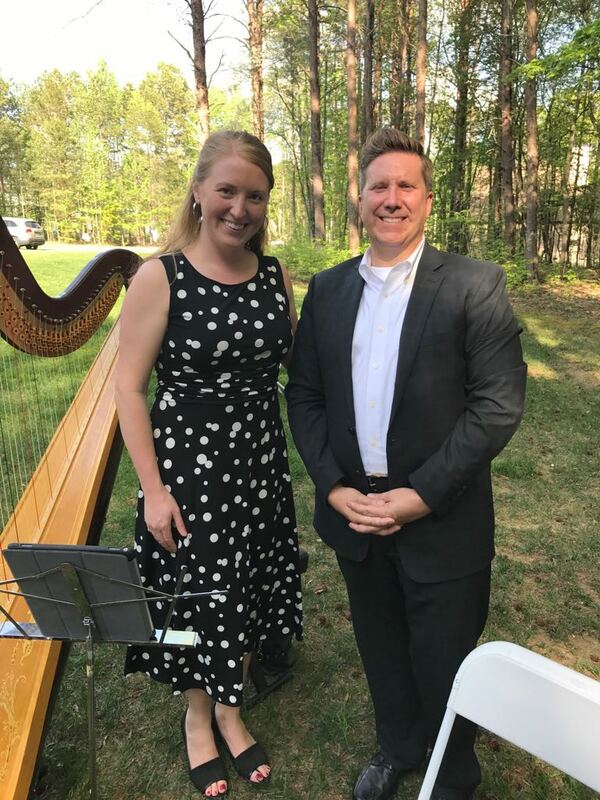 Andrea Mumm is the Principal Harp of the Charlotte Symphony Orchestra and has over 15 years experience playing weddings, events, parties, and church services. She is able to play for indoor and outdoor wedding ceremonies and receptions in Charlotte and the surrounding areas. Andrea offers a wide selection of music and can easily tailor the repertoire to your specific event! In the complimentary consultation Andrea provides, she works with the client to find the perfect blend of music for the event. Contact Andrea to book today! Andrea played for my family’s Christmas gathering. It was perfect. She played any and every Christmas song we requested.... beautifully and flawlessly. Highlight for my family! It was an honor to have her start our wedding ceremony! I love her professionalism and attention to detail. If you’re striving for elegance, I highly recommend booking Andrea for your event. She played amazing and was so easy to deal with. If she didn't know a song she learned it and was able to add a violinist at the last minute when we asked. Highly recommended! I just wish I could have heard her play more! Andrea was amazing. She played beautifully, just as we had arranged previously. Andrea is professional, talented and reliable. She showed up a little early and played beautifully. I sang two songs with her and was patient at all times. Most of all she was so nice and sincerely pleasant. Never hesitate to book her. Simply fantastic!!! Andrea Mumm, harpist, provided background music during the cocktail hour prior to a Rotary Club gala dinner. She was very professional in all aspects of her performance. She arrived early and was ready to play before the appointed time. At our club's request, she played a variety of music including Broadway show tunes, light Classical, and some jazz favorites. She is a wonderful musician and received many compliments from the guests. 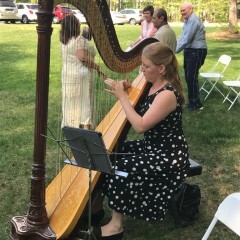 Andrea played harp during my wedding ceremony. We asked her to arrange a relatively obscure STAX soul recording from the 1960s for my bride to walk down the aisle and she absolutely nailed the arrangement. Her playing was beautiful and the perfect background music for our ceremony! 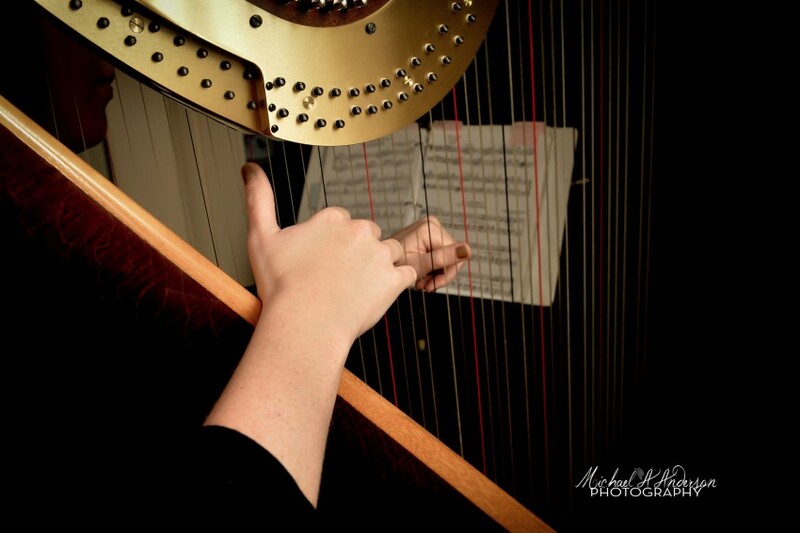 We would definitely recommend her services to anyone looking for a harpist for a wedding or any other event. Andrea played at our wedding on June 18, her playing created just the ambiance we were looking for. It was just lovely and added the perfect touch, to both our ceremony as well as during dinner. Andrea was very professional and truly cared about playing the music we wanted for our special day. I would highly recommend Andrea and would absolutely ask her to play for any event. 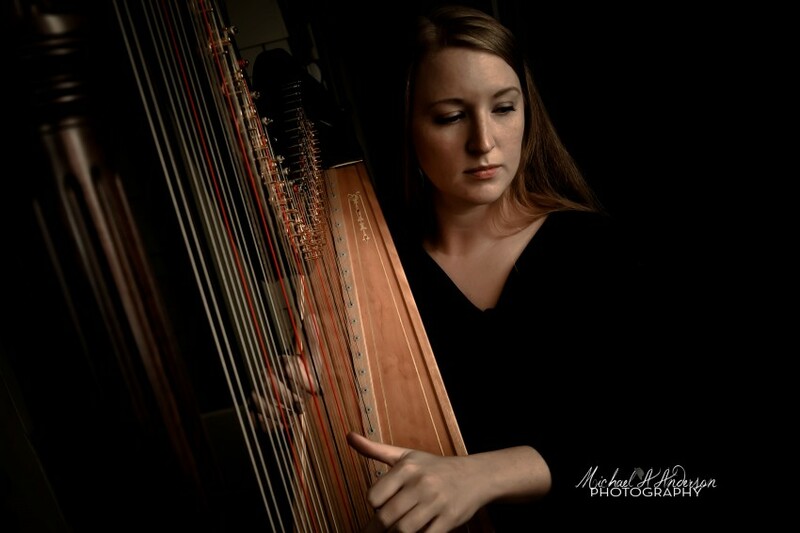 If you are looking for the best harpist in Charlotte to play at your wedding, Andrea is your answer. Andrea played at our wedding and cocktail hour in April 2016 at the Duke Mansion and was an absolute joy to have be a huge part of the most important day of our lives. We booked Andrea after I researched and YouTubed every harpist around. She was our first choice. She was always quick to respond via email and text and very friendly and professional. A couple months out of the wedding we had our private consultation with Andrea - and I was blown away. Her harp playing is second to none. It is magnificent in person. She walked us through the whole ceremony and offered to play whatever we wanted to hear as well as her own suggestions since we were pretty clueless with ceremony music. After hearing her play that day I said to my then fiancé, "I just got really excited about this wedding". On the day of our wedding she was on time, professional, completely self sufficient, and her performance was flawless! She didn't even skip a beat but flashed a huge smile and kept on playing when our 11 month old ring bearer decided to quit walking down the aisle and stopped to point and coo at the pretty harp (before swiftly being whisked back on track by his bridesmaid mother) which made for one of the most adorable moments of the whole ceremony. Great job Andrea!! 10/10 would book again in a heartbeat. I was amazed by Andrea's talent! She was professional as well. She has passion for her music and it shows. She was part of my perfect wedding dream!! I'll never forget the beauty. Andrea was a pleasure to work with, she offered great music selections and played me samples of various songs for me to choose from. During the ceremony she was professional and her music was a great addition. Many of my guests commented on how beautifully she played. Andrea was extremely professional and so helpful. She helped us pick our music selections for the ceremony. She is a fantastic harpist!! Inwould highly recommend her! Nothing sets a wedding mood like harp music and Andrea's music was simply perfect. Her music choices were great and her talent is amazing! Andrea played at our Muse event and everyone really enjoyed her music. It was the perfect backdrop to our evening. She was very prompt and professional. 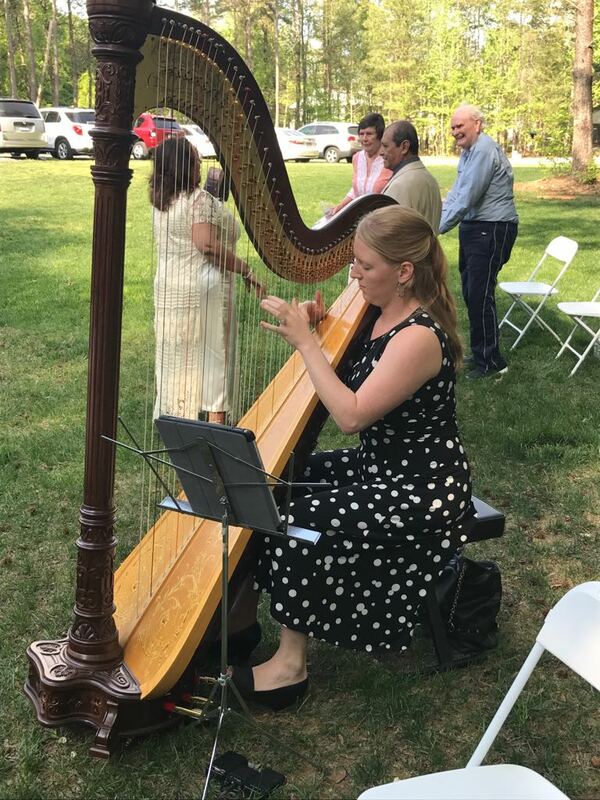 Andrea recently played the harp for a VIP event we were hosting here at The Duke Mansion. It was a very important and special event for us and we were so pleased with Andrea's professionalism, beautiful talent, promptness and her passion! She was on time, dressed beautifully and was ready to go! She played for several hours and took cues very well when our guests we ready to make speeches throughout the evening. Highly recommend her! We thoroughly enjoyed working with and listening to Andrea. She offered many music styles and selections to create the mood we wanted exactly. The children at the service were completely enthralled by the music. Andrea played for our daughter's wedding and for the cocktail hour following at the VanLandingham Estate. She is an accomplished musician and so accommodating! She even learned a new piece we requested for the ceremony. She was prompt and collaborated with the wedding director graciously. We highly recommend her! Harp can add a special touch to any event or function. 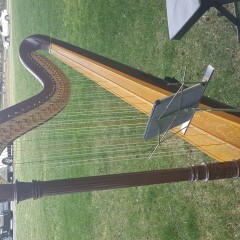 Music ranging from classical to jazz standards sound incredible on the harp. Andrea performs regularly not only at weddings, but also receptions, church services, business functions, cocktail hours, holiday events, wine tastings, dinner parties, baby showers, afternoon tea, funerals, and birthday parties. Andrea offers a wide selection of music and can easily tailor the repertoire to the specific event. In the complimentary consultation Andrea provides, she works with the client to find the suitable blend of music for the event. If you have a certain piece in mind that is not found on Andrea's repertoire list, she would be more than happy to learn it for your day! Wedding packages include prelude music for seating of guests, all processionals, music during the ceremony, recessional, and postlude music for when guests are exiting. Also included is an in-person consultation with Andrea to work with the client to hand pick the best musical selections as well and unlimited e-mail and phone correspondence. Harp works beautifully for cocktail hours as well! Andrea requires no additional equipment and brings her own music stand and bench to every event and wedding. The harp sound carries well and, in most cases, no extra amplification is necessary. 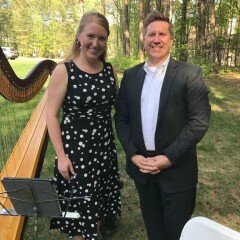 A native of New Jersey, Andrea Mumm holds the Dr. Billy Graham Principal Harp chair of the Charlotte Symphony Orchestra. Praised for her ability to “handle filigree solo passage with aplomb” and her “serene…and sweetly swoony” playing by the Charlotte Observer, Andrea is regarded as one of the top harpists of her generation. 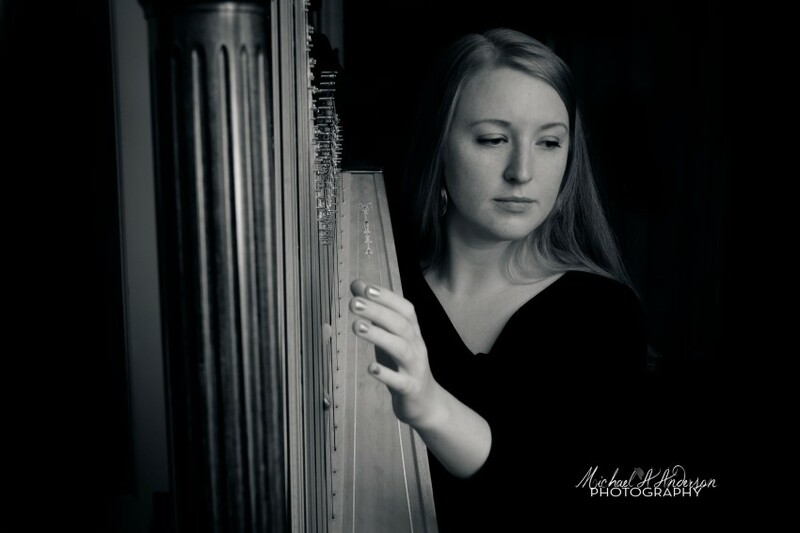 Andrea has performed with the Colorado Music Festival, Civic Orchestra of Chicago, National Repertory Orchestra, Peninsula Music Festival Orchestra, Mercury Opera Company of Rochester, and the Brevard Music Center Orchestra in addition to having toured extensively throughout North and South America as Principal Harpist with the Youth Orchestra of the Americas. Andrea is able to play outdoor events, but with certain requirements. 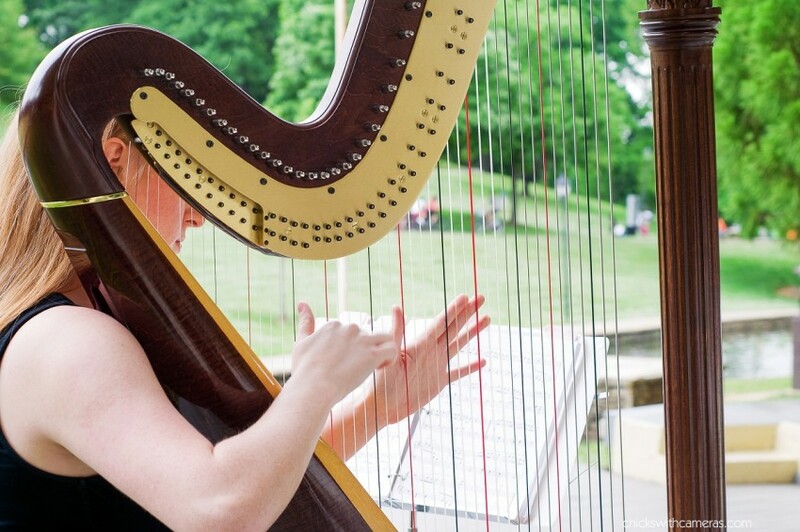 The harp needs a flat, dry surface on which to stand, preferably with a covering (gazebo, tent, etc.). 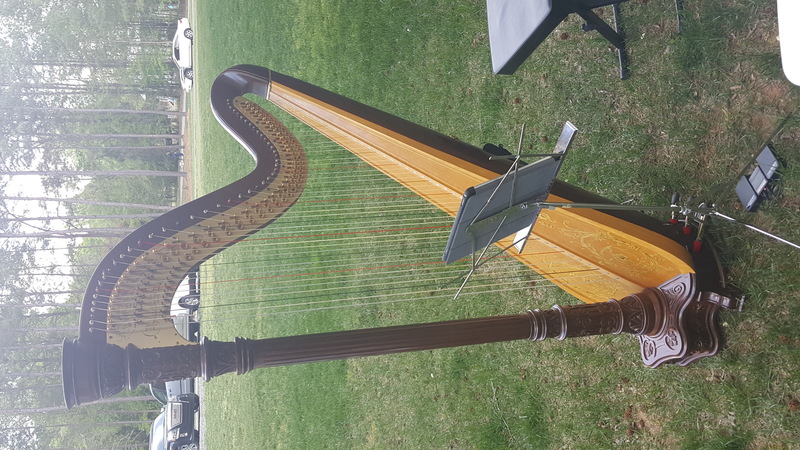 Generally, the harp takes up an area about the size of 4’ X4’. At the first sign of inclement weather (ex. rain, extreme heat, extreme cold), Andrea will have to move her harp indoors for the safety and protection of her instrument. Due to the delicate nature of her instrument, Andrea is unable to play outdoor events if the temperature is below 50F. The harp is roughly 81 pounds and stands 74” tall. Andrea has her own “harp car” and is fully self-sufficient when transporting her instrument. For most occasions, the harp does not need amplification! The harp sound projects well and Andrea can adjust her playing volume based on the venue space. If amplification is necessary, a standard microphone will do.